Elsa Schiaparelli (French, born Italy, 1890-1973), by Jean Clément (French, 1900-1949). Necklace, Fall 1938. Clear Rhodoid (cellulose acetate plastic); metallic green, red, pink, blue, and yellow painted pressed metal ornaments). Courtesy of The Brooklyn Museum Costume Collection at The Metropolitan Museum of Art. Mark your calendars, lovers of fashion exhibits! Next spring’s Costume Institute show at The Metropolitan Museum of Art is titled Elsa Schiaparelli and Miuccia Prada: On Fashion and will feature the work of Schiaparelli, the Surrealist Italian fashion designer (Chanel’s biggest rival in the 1930s) in a “style conversation” with the work of another iconic Italian designer, Miuccia Prada, whose bags and shoes and clothes I routinely lust after (I bet you do too). It will be co-curated by Harold Koda, Curator in Charge of The Costume Institute, and Andrew Bolton, Curator, The Costume Institute, who curated this year’s unbelievably successful Alexander McQueen: Savage Beauty. It will be on view from May 10 through August 19, 2012. In honor of this news I thought I’d post a photo of one of Schiaparelli’s works. 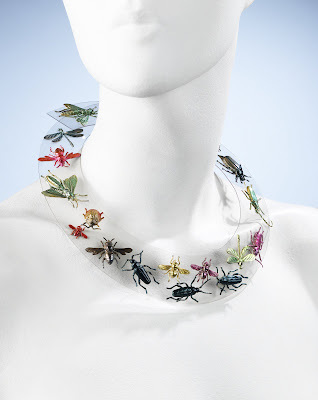 The above insect necklace is one of her most famous accessories. 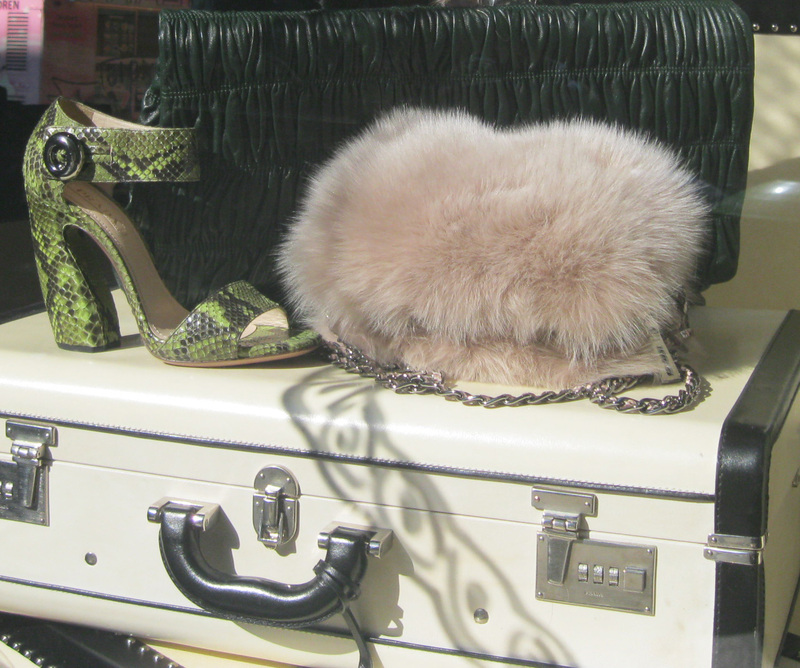 And in keeping with that theme, below are recent Prada windows at the SoHo store on Prince Street, showing the accessories for Fall/Winter 2011-2012. I am in love with that green snakeprint pump. Those pumps are calling for you to try them on:-) I am swooning over them. Thanks for the information on next spring’s Costume Institute show at the MMA. I have never been there so this could be my inspiration to visit the city. Oh, I would love to see it! I have not been to the MMA in many years!! Thanks for your many sweet encouraging comments, Jill..
Prada is very hit and miss with me - the bugs scare me, I love the powder pink fur and I'm still undecided about the snake print shoes. I did absolutely love the lace story she did a couple of years ago though! Hi Pam, I thought your post on being in deep debt in order to own some of the most expensive brands out there (Louis Vuitton, etc.) was a great one. I think if you submit it to IFB Links a La Mode it will be selected! Hi Veshoevius, I know what you mean about hit & miss with Prada. The lace dresses and skirts she showed a couple of years ago were glorious! However, those crazy fur hats I see in the current ads that make the girls look like Tamarin monkeys? Uh, no thank you. However, every time I go inside the Prada store I always find at least one accessory I fall in love with, either a pair of shoes, or a wallet or a stunning, will-have-it-forever bag! I'm diggin' those pumps too! Hi Marina, I like that pink fur bag too but I don't think I could carry it. It's interesting to me that there are two 'no' votes on Schiaparelli's famous bug necklace! Vahni! I can't believe you even have time to stop by my blog, let alone comment. I saw the first post on your Barcelona trip and you look amazing, as always! I can't wait for you to share more trip photos and to tell us about the bloggers you met. It looks so far like it was a great, successful trip! And you could wear those snakeprint pumps, I can just see them on you. Jill, I need to come to NY to see this! MUST save my pennies!